Food and football go together like a peanut butter and jelly. If you have one you need to have the other. 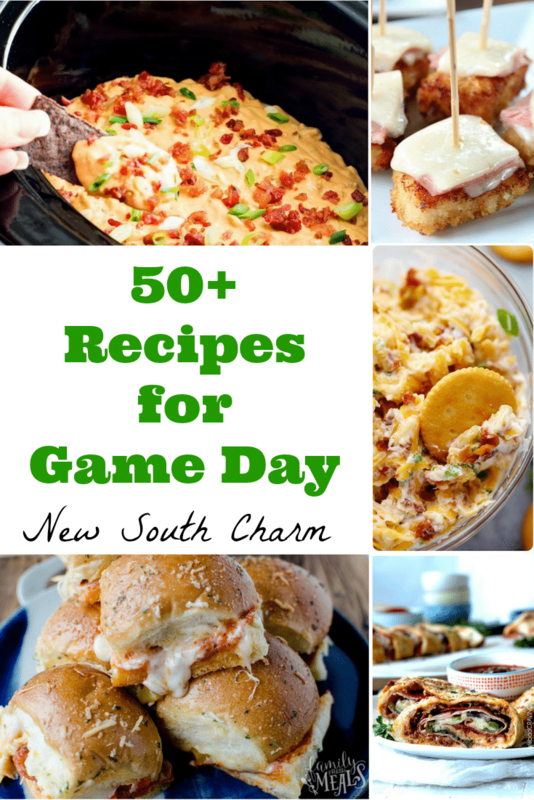 That why today I’m sharing with you more than 50 0f my favorite things to chow down on while cheering on my favorite teams. They don’t call it 5 Million Dollar Dip for nothing. It is so deliciously addicting and will be the biggest hit wherever it goes! 35 Minute Stromboli is perfect for game day or a fun, customizable dinner! A good old-fashioned cheese ball gets the works with bacon, jalapeños and lots of flavor in this Bacon-Jalapeño Cheese Ball. These Buffalo Chicken Pizza Sticks are absolutely perfect for parties or a fun dinner. Dig in to these cheesy, crispy loaded Hasselback potatoes! If you love cheesy appetizers, this Crab Artichoke Dip is a must-make for game day. This Slow Cooker Beef Queso Dip is a touchdown every time! Chicken Cordon Bleu Bites are crispy, crunchy bites of deliciousness! Enjoy this 4 ingredient Bacon Wrapped Jalapeno Popper Chicken as part of your game day feast. These little hands-sized Pizza Sliders are a lot easier to slice and serve more neatly than a big pizza pie. These Game Day Loaded Nachos are overflowing with seasoned ground beef, ooey gooey melted cheese, fresh tomatoes, spicy jalapenos and crisp green onions. Slow Cooker Sweet and Spicy Sausage is absolutely addicting! Love salted caramel? Then you’ll want to add this Salted Caramel Rice Krispie Treat Recipe to your game day dessert list! Homemade Soft Pretzel Bites are fun to make, fun to eat, and a great game day snack. This creamy and dreamy Kickin’ Cowboy Queso Dip combines smoky, cheesy, and just the right blend of sugar and spice for a kickin’ dip! These Jalapeño Popper Chicken Sliders are everything good about game day food. When it comes to game day snacks you can’t go wrong with this Easy 4 Layer Dip. Parmesan Crusted Tortellini Bites are fried to golden perfection and dipped in warm marinara sauce. Chicken & Waffle Sliders is a classic comfort food turned awesome game day appetizer! Need to add something sweet and FUN to your Super Bowl party? Try these Ice Cream Football Sandwiches. Philly Cheesesteak Sliders Will Get MVP At Your Super Bowl Party. Cracked Out Turkey Pinwheels are an ideal tailgating food. You know what’s easy? Letting guests serve themselves at this Super Bowl Nacho Bar. These Football Cupcakes are sure to be a hit! This Buffalo Chicken Crescent Roll Ring is super-easy and perfect for taking to a party. Another cute idea for a Super Bowl party, guests are sure to love these Football Pizza Pockets. Corn Dog Mini Muffins are everyone’s favorite corn dog made into the easiest mini muffins. No matter which team wins, everyone will be happy with these Brownie Bowl Sundaes! Cheer on your favorite team with Football Puppy Chow!